The Song of the Stork is a relatively short but very powerful story of survival against all odds during World War Two. Yael is a 15 year old Jewish girl in Lithuania who has been forced to flee for her life when the Germans raided her village. Finding herself alone, she seeks refuge with Aleksei who is mute and very much distrusted by his community. Together these two outsiders grow closer and support each other through a harsh winter until once more the Germans come and Yael is forced to find another place of safety, this time with a Jewish partisan group sheltering in the forest. This book is beautifully, hauntingly written as the devastation of the villages and the landscapes as well as personal devastation is evocatively described. I found it took me a while to get involved with the story but once I was emotionally invested in the well-being of Yael, I couldn’t put it down. For me the strongest part of the book was when Yael was living with the partisans in the forest and in the face of danger began to find hidden strengths that she didn’t know she had. The author has vividly described the random cruelty and savagery of war. He brings home strongly the immense courage of those who did help and shelter Jewish people during the war at tremendous personal risk. I cannot imagine the fear and the bravery which must have been felt by both those being sheltered and those who were helping. It made me question whether I would have been brave enough to stand up for what was right and I suspect, like many, the answer is probably not. Haunting, moving and harrowing, The Song of the Stork shows both the worst and the best of humanity in this powerful novel. I absolutely loved this book and I knew you’d like it too! Great review of a wonderful book, Joanne. I loved this one too! Great teview. You might be interested in reading my interview with Stephan as part of the blog tour- words andleaves.com – he was a good guy to talk to. 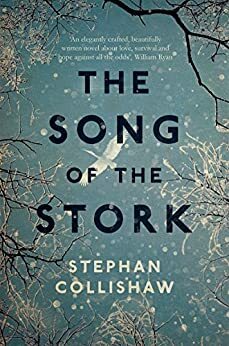 Check out the book, The Song of the Stork, by Stephan Collishaw, on the Portobello Book Blog.